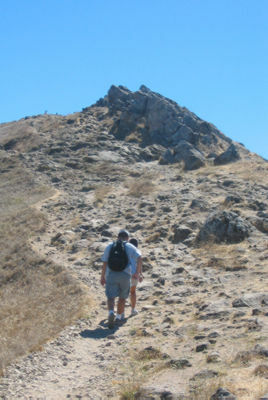 I noticed the other day that it’d been more than a week since my last post … and it just so happened that a hiking club called Walk East Bay had squeezed my favorite local hill — Mission Peak — onto its calendar. So I climbed the peak for the third time this summer. I wanted to test my theory that climbing this thing never gets easy, just progressively less brutal. The experiment was a success. It was in the low 80s when we started out — fortunately it didn’t get too much warmer than that, but it was hot enough. I filled my 100-ounce hydration pack to the brim and had sucked it dry by the time I got back to the car. Three of the four who walked with me this morning. 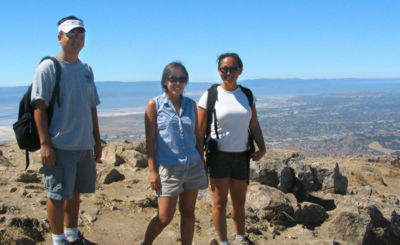 At left is Vanessah, who planned the hike. Next to her is Stan, her hubby, and next to him is Ed, who lives just down the road a ways in Fremont. Helen was the fifth in our group. She had the pack, the shoes and the pace of a veteran hiker, which is to say she got to the top long before the rest of us. 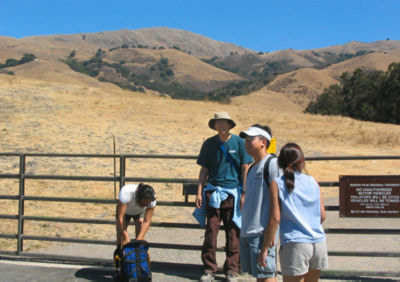 This is near the beginning of the trail — the blue sky and brown grass tell the tale. Helen and Vanessah made me promise I’d post only the flattering pictures of them. 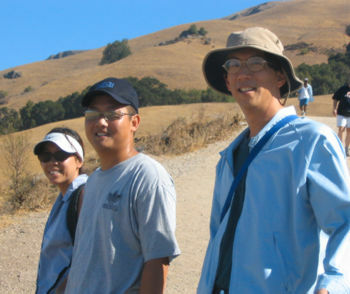 To me the most flattering pic is the one which shows the hiker has enough sense to adapt to current circumstances, which could entail putting a towel on one’s head to keep the sun from melting it. Just a nice shot of the peak and the surrounding vegetation, what’s left of it. A particularly steep patch near the top of the hill. This would be one of the last times I’d be leading our foursome. Stan and Vanessah get their second wind and start picking their way through the rocks near the summit. I found that I was just about out of energy at this point, so I reduced my pace to little baby steps that kept me moving at tortoise speed till my pulse got back to somewhere near normal. 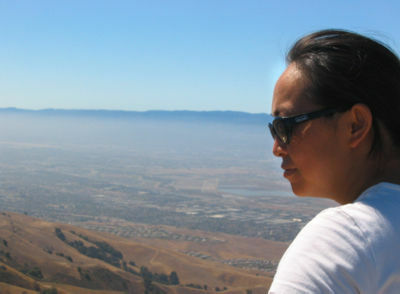 Helen at the top, with Silicon Valley in the background. It was nice having somebody to welcome us to the summit. Getting ready to head back down. It’s amazing how people are so good at following orders when somebody with a camera yells "everybody smile now!" Resting in a shady spot on the way back down. 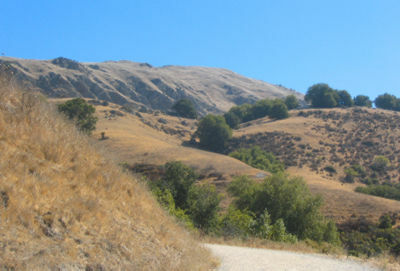 There are perhaps four such spots on the entire six-mile roundtrip. All done — with the peak looming far, far behind us. 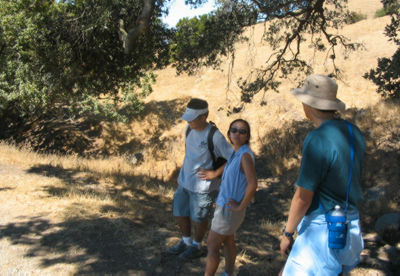 Helen and I were the only ones in our group who had hiked this trail before. Ed told me at the beginning he’d hike maybe an hour or so and head back. He didn’t — he went all the way up. 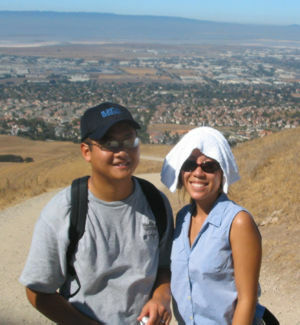 I heard Vanessah telling Stan, after about the first half-mile, that she didn’t think she could make it to the top. But she did. It’s cool to see people in a group do things they didn’t imagine they could do — and probably wouldn’t if they had to do it solo. I had to walk a lot of miles on other trails before I began to imagine I could make it to the top of this one. But really, it’s only three miles to the top. 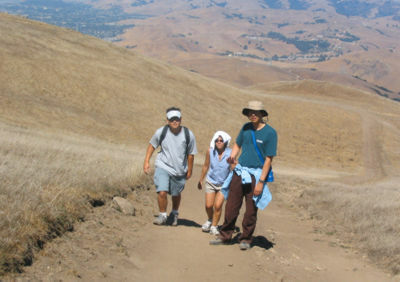 Almost anybody in reasonably good shape (with healthy feet, knees and heart) can make it up there, provided they have enough sense to walk slowly and take lots of breaks. I suppose this sounds trite, but it occurs to me that the real hill we have to climb is the one inside us, in that part of the brain that tells you the satisfaction of getting to the top will justify the suffering along the way. It’s a lot easier to find that place if you’ve got people to share the pain. Well-told story and excellent photos that well capture some moments… Thanks, Tom!